Maine Governor Paul LePage’s office is defending a strongly worded letter he sent last week to Governor Charlie Baker accusing the Massachusetts toll collection system of bullying a Mainer into paying unjust late fees after driving through the Bay State. “Upon looking into the constituent complaint, Governor LePage was so concerned by the extent of the problem and the volume of complaints to both Maine Turnpike staff and the Bureau of Motor Vehicles ... that he decided to bring this problem to the attention of Governor Baker,” said Peter Steele, a spokesman for LePage, in an email Tuesday. In the letter, dated July 31, LePage wrote that a Maine resident had to fork over more than $26 in fees “for a mere $6 in tolls” after the EZDriveMA system in Massachusetts failed to process his payments in a timely manner. LePage said EZDriveMA reps treated the man rudely when he called to inquire about the processing delays. The reps also warned that he could have his driver’s license suspended if he didn’t pay up. “This unprofessional behavior looks more like a shakedown than the legitimate collection of tolls,” LePage wrote in the letter, which was first reported on by the Boston Herald and Portland Press Herald. LePage said he’s learned that other drivers from his state have been hit with unwarranted late fees by their neigbors to the south. In addition, LePage said, EZDriveMA reps “inappropriately” threaten Maine drivers with license suspensions. LePage didn’t elaborate, and his spokesman declined to comment, saying the governor’s office couldn’t discuss legal strategy. Baker’s spokesman declined to comment Tuesday, referring questions to the Massachusetts Department of Transportation. Patrick Marvin, a spokesman for the MassDOT, defended the toll collection system in a statement but did not respond directly to LePage’s allegations. Peter Mills, executive director of the Maine Turnpike Authority, insisted Tuesday that any information about state residents having issues with Massachusetts late fees did not come from the authority. 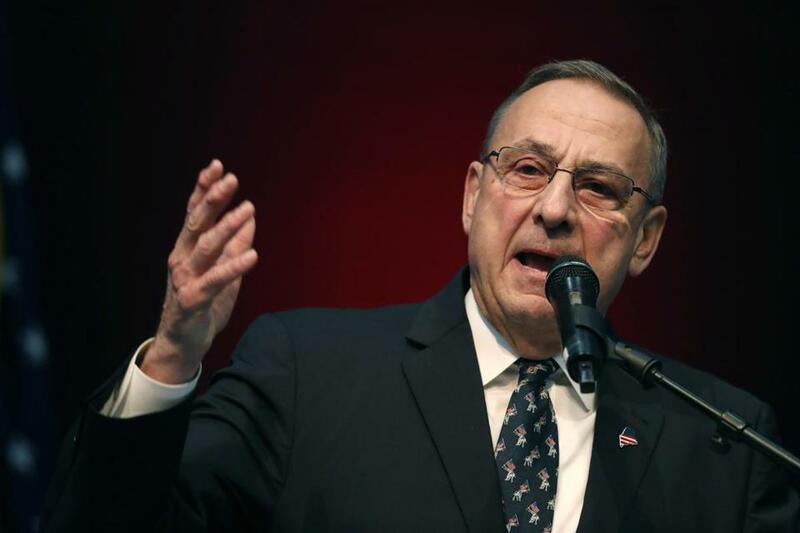 “All I said [in prior interviews] was the Maine Turnpike isn’t receiving those complaints,” said Mills, a former Republican gubernatorial primary opponent of LePage. Maine drivers, Mills said, who receive letters to pay Massachusetts tolls and fees get notes from the contractor that runs Massachusetts collections. Mills said the political ambitions of his sister, who hopes to defeat the term-limited LePage’s “chosen successor” on the GOP side, “has nothing to do” with his statements about toll collections. Mills also addressed that contention in his e-mail. Maine Secretary of State Matthew Dunlap, whose office oversees motor vehicle registrations and licenses, said Tuesday that vehicle registrations, not licenses, are sometimes suspended for non-payment of toll fees. But that penalty, Dunlap said, is generally reserved for “people who don’t respond” to bills. “It’s not an overwhelming amount” of the suspensions, Dunlap said. Asked about LePage’s decision to send the letter to Baker, Dunlap, a Democrat who’s elected by his state Legislature, struck a diplomatic tone. Dunlap said he ultimately doesn’t think “much is going to happen with this,” since LePage “doesn’t have an awful lot of jurisdiction” over Dunlap’s office or Mills. However, Dunlap said, the public spat does come with a silver lining. “It has raised some awareness about the toll violation issue, which is probably not a bad thing,” Dunlap said. Material from the Portland Press Herald was used in this report. Travis Andersen can be reached at travis.andersen@globe.com. Follow him on Twitter @TAGlobe.